Wedding planning between an engaged couple that involves a "glass of wine or two" typically results in a decision to tack on a few extra names to the guest list, maybe go wild with chocolate instead of vanilla cake or forget the whole affair. For Alex Pelling and Lisa Gant, a couple from Manchester, England, that planning session resulted in a change-your-life-forever decision to get married 30 times in 30 of the most unique and unusual locations they could find around the globe. "As we looked for a place to get married before we left our lives behind to travel around the world for the years, the wedding opportunities offered to us did not suit what we wanted," Pelling, 32, told Goodmorningamerica.com as the couple traveled through Uruguay to Brazil for ceremony number 24. "We decided to look for the perfect place to wed as we traveled," he said. "After a glass of wine or two, the idea grew and we made a decision to have a small ceremony in every country we visited with the local cultures and traditions in mind." The couple, who met in 2000, dated and then went their separate ways for five years before reconnecting, sold Pelling's car business and their home to make their dream come true. They began their adventure on July 5, 2011, with a first ceremony in their hometown of Manchester. 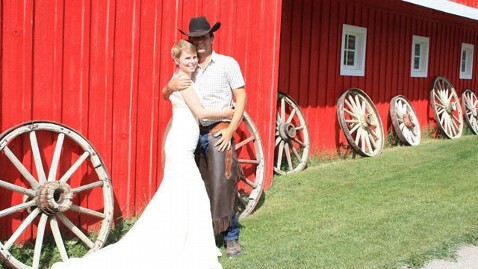 Since then, they've traveled the globe in their "savior," a 25-year-old Dodge camper nicknamed "Peggy," tying the knot in Los Angeles, Honduras, among dolphins in Hawaii, on a vineyard in Quebec and on horseback in Banff, Alberta, Canada, just to name a few. "There is no system to our approach," said Pelling. "We don't really choose [a location]. If we find a fantastic photographer that wants to be involved, we ask where they recommend." "Sometimes we email ahead to wedding vendors. We get introduced to people," he said. "People have even been contacting us recently! Every wedding is so different." Pelling and Gant, 30, document their travels in a blog, 2people1life, where friends, family and the curious can view their wedding photos, track their travels on a map or RSVP to join them at their next wedding ceremony. The notoriety has led to some assistance with perhaps the only thing that could match the stress of finding a location, choosing a wedding dress. "We were lucky enough to be given a wedding dress at the first wedding by the designer Charlotte Balbier," Pelling said. "Aside from that. we borrow outfits depending on the type of wedding. In Peru, the famous wedding dress designer Fatima Arrieta was so taken by our adventure that she lent Lisa three dresses to wear." That ceremony in Peru, described by Pelling as "so emotional, touching and stunningly beautiful," currently ranks as tops for the couple, an important factor considering their favorite location will be the destination for their final wedding - the only one legally recognized - when their travel adventure is over. "We think maybe four months after the end of the trip will be when we will hold the official wedding, but who knows when that [will be]," he said. "[We have] at least another two years of traveling to go! And where? … We have no idea!" To pay back all the generosity they've received on their journey so far - only once were they turned away by a church, which then invited them back to attend mass and receive prayers - Pelling and Grant have asked people to make donations to UNICEF in lieu of wedding gifts. They're now also running a competition with Zankyou and UNICEF to fly two people to their final destination wedding. Speaking of that final wedding, how do you possibly settle back into a "normal" life as man and wife after completing the ultimate destination wedding? If you're Pelling and Gant, you keep that same adventurous spirit, just maybe not in "Peggy" full-time. "We plan to end up in Australia. … That will be the start of our next adventure," Pelling said. "Then maybe children, a dog, a sheep or a kangaroo."